‘I’m still awake, still!’ called Fiddy. Fiddy is a busy little boy so, when bedtime comes, he finds it hard to get to sleep. Marlo tries reading him a story, and Parlo tells him to sing a song in his head. But Fiddy is still awake. His family are busy downstairs, so Parlo seeks help from the animals and flowers. Eventually, it is Nonno’s song, and his patience, which lull Fiddy off to sleep. I’m Still Awake, Still is more than a bedtime story, though it is certainly that. Accompanying the tale, illustrated by Elizabeth Honey, is a CD recording of the songs which feature in the story, written by Honey and singer/composer Sue Johnson, from band Coco’s Lunch. The story is also read aloud by Honey on the CD, and the lyrics of the songs are printed on the endpapers of the book. There is much to be discovered here, and enjoyed on different levels and at different times. One could imagine the CD, for example, being played at rest time either at home or in a childcare setting. A postcard from Leo Schmidt? I’m trying to solve the mystery of a boy called Leopold Schmidt who migrated to Australia years ago. Leopold is long dead, but this new Leo is very much alive (and kicking). When Henni leaves a note in a box of old books under a house, she doesn’t really expect it to be answered by someone living on the other side of the world. But in a curious set of coincidences, the note she left for anyone related to Leopold Schmidt was found by the uncle of thirteen year old Leo, who lives in Germany. Soon, Leo and Henni are exchanging emails, trying to unravel the mystery of Leopold. Then there are the dramas of their own lives, which they share with each other in a way more honest and intimate than if they lived in the same town. To the Boy in Berlin is a funny, but also sad and insightful story, told from the dual perspectives of Henni and Leo, through their exchanged emails. Each character’s emails have actually been written by a different author, in an unusual collaboration between Australian author Elizabeth Honey and her German translator, Heike Brandt. The idea was developed long distance, but fleshed out when Brandt was able to visit Australia. The character of Henni will be familiar to fans of Honey’s work, having earlier appeared in titles including The Ballad of Cauldron Bay and Fiddle Back. The addition of a second viewpoint character and the novelty of the email format will delight fans of the earlier books, but this new offering also stands alone. Great reading for 10 to 14 year old readers. When grade six gets to go on a camp to a pioneering village, Mark and his mates are rapt. No school and no parents for a whole week. But, best of all, they get to escape from the teacher they call the Bomb, who has it in for Jonah, one of Mark’s mates. But when one of the teachers on camp falls ill, guess who they send as replacement? With the Bomb there, the whole camp could be ruined. 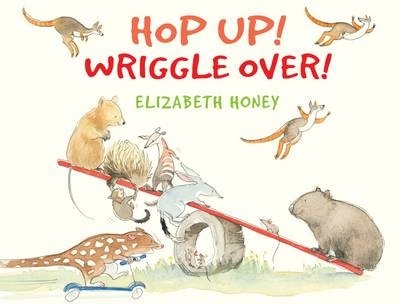 Don’t Pat the Wombat is a fun story which deals with serious issues of friendship, victimisation and adult alcoholism, but in author Elizabeth Honey’s hands, these serious issues are dealt with using humour and loads of interest, to engage readers without trivialising the issues. This audio book version is read by Damon Herriman, whose reading brings the first person narration of Mark to life, and gives life to the character and his tale. Henni is back. First seen in 45 & 47 Stella Street, and later in Fiddle-back, this third book has all the laughs and growing pains that can be expected from author Elizabeth Honey. When Tibor is offered the use of a house at remote Cauldron Bay for the Easter holidays, he invites his friends from Stella Street to come along. Henni can’t wait to get there, but it takes time to negotiate who is going and for how long. Still, like all good things the holiday finally begins and is going just great, until Tara comes along to ruin it. Tara is sophisticated and very into boys. She’s come on holiday because things are not going well at home. Tara doesn’t do things the way Henni and her friends do, and Henni is not happy about her holiday being wrecked by this intruder. She is learning that not everything goes to plan and that being a teenager is complicated. The Ballad of Cauldron Bay sees Henni growing from a child into a teenager. As with the earlier books, Henni acts as narrator, recounting the tale in a chatty-first person style which is complemented with the pictures she draws both to explain and for simple illustration. This time round Henni has a new computer on which to compose her story. She has given her computer a name (Byron) and addresses him directly within the story, reminding the reader of her youth and her presence as a narrator telling a story in retrospect. In true Honey style, The Ballad of Cauldron Bay is a delightful mix of humour and drama, of issues and dilemmas and of poetic language. An outstanding read.